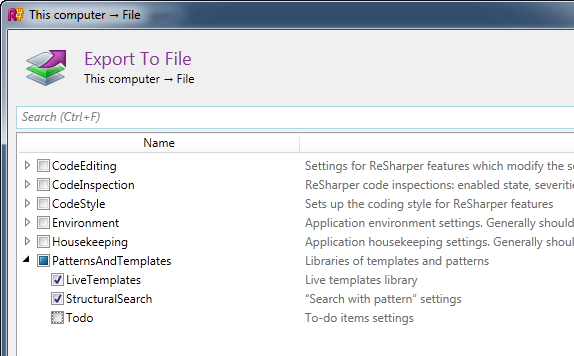 One of the changes introduced with the new settings in ReSharper 6.1 is how importing and exporting of templates and custom patterns are done (Custom Patterns were previously known as Structural Search and Replace). As part of the unification of settings, Templates and Patterns now fall under the same modus-operandi when it comes to importing and exporting as other settings do. This is very similar to how our IDEA based IDE’s such as IntelliJ, WebStorm et al. work. However, certain legacy functionality is also available depending on what needs to be done. At this point we can select whether we want Live Templates, Patterns (StructuralSearch*) or both. 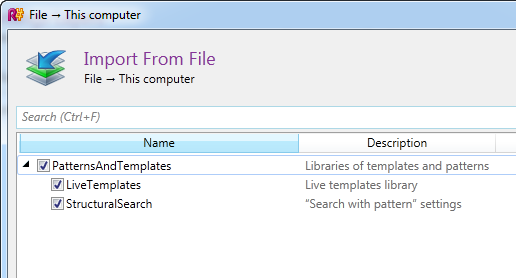 It is important to note that if you do not have any user defined templates and/or patterns, then these options are not available, i.e., you would not see the LiveTemplates / StructuralSearch checkboxes. 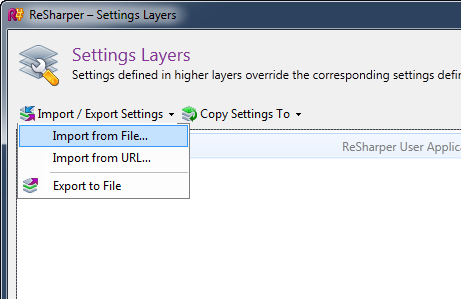 The exported file format is only compatible with ReSharper 6.1 and higher (.DotSettings file). The benefit of this approach is not only that it keeps all settings centralized, but it also allows us to mount and un-mount related templates. 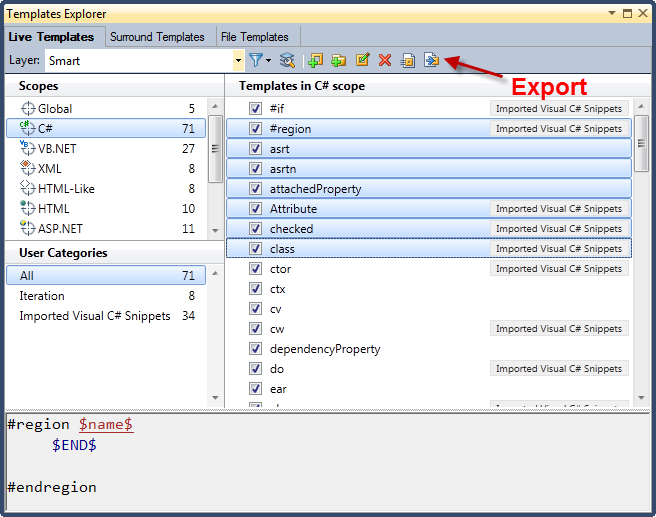 We can then select individual templates and choose the Export button. This is basically the old behavior prior to ReSharper 6.1. The difference however is that the file exported is in the new .DotSettings format. In this regard, there is no difference between this approach and the previous Manage Options one. Although this allows the newer DotSettings file format, we usually should only use this when trying to import legacy templates (from version 6.0 and lower). With the new settings we’ve hopefully made sharing of Patterns and Templates a little easier. There are still improvements to make but any/all feedback or changes you’d like to see are welcome. Please log them in our issue tracker so that they can be managed better. This entry was posted in How-To's and tagged generation and templates, ReSharper, ReSharper 6, settings, structural search and replace (SSR). Bookmark the permalink.